There’s a few Unknowns on the cover; if you recognise any (or any of those I haven’t labelled as I thought they were too generic/obscure) use the Contact Form to get in touch. Page 1 – Panel 1: “See, it’s an ordinary day in the DC Universe…!” As opening lines go, this doesn’t win any awards, but it sets the scene as nothing unusual is happening. Page 1 – Panel 2: Justice League International. In the air, left to right are Green Lantern Guy Gardner; Martian Manhunter; and Captain Atom. On the ground are Batman; Booster Gold; Blue Beetle; Black Canary; Mr Miracle; and Oberon. Page 1 – Panel 4: The “geriatric leader” that the American delegation in Moscow is thinking about, would be Ronald Reagan who was the US President at the time of this series. An unknown redhead; an unknown blonde woman; possibly Randolph West, father of the Flash; Superman’s friend, Lana Lang; Harry Hadley who works on the Captain Atom project; and sat on a crate on the right, Overthrow, a Blue Beetle villain. In front of them are an unknown African America woman; Mr Smith, the current owner of Ferris Aircraft; and Mary Cassidy, Blue Devil’s sister. 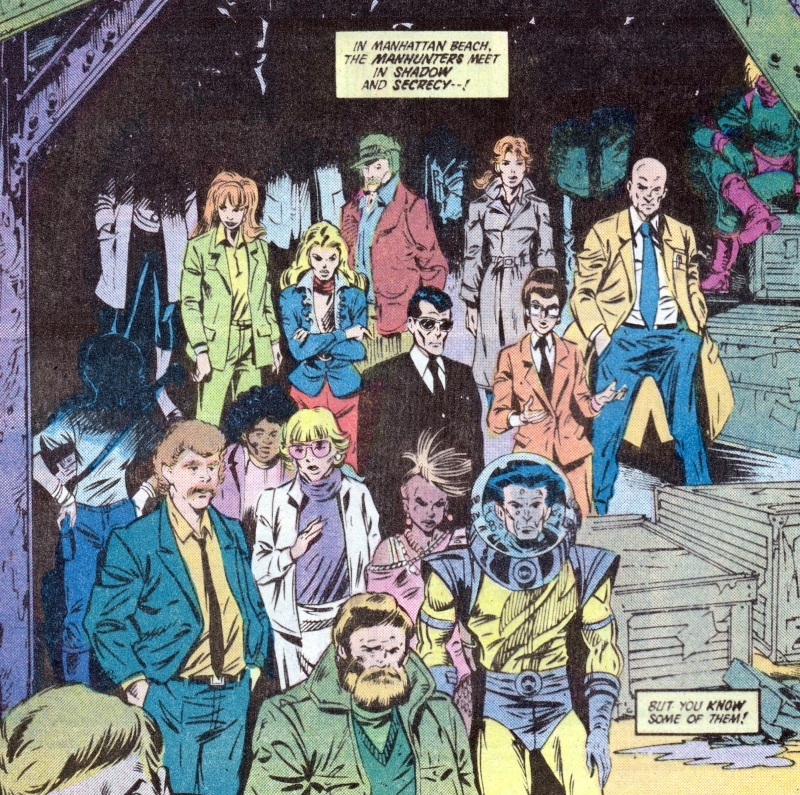 In front of them are Dirk Davis, Booster Gold’s manager; Marcie Cooper, Obsidian’s girlfriend; an unknown woman with a Mohawk; and a helmeted villain. In front of them is a bearded man who we’ll meet again in issue #4. Page 3 – Panel 1: Throughout the series, captions or dialogue identify characters making my job of annotating things either easier or pointless on your point of view. Here we have the unknown blonde woman; Mr Smith; Lana Lang; Mary Cassidy; and Henry Hadley. Smith and Lang have captions that indicate which heroes they’re connected with, while both Cassidy and Hadley use dialogue to rather clumsily identify their connections. Page 3 – Panel 2: Dirk Davis, Marcie Cooper and the helmeted villain, however, offer no such clues. It would have been handy in order to identify that villain, though. Page 3 – Panel 5: The Grandmaster of the Manhunters. While the Manhunters have, over the years since MILLENNIUM, had something of a resurgence as antagonists of various Green Lanterns, I’m unaware of any reappearance of the Grandmaster. Page 4 – Panel 1: Here the Grandmaster reveals that the assorted Manhunters have been acting as sleeper agents, waiting for something to happen to trigger their reappearance. Page 4 – Panel 2: And who’s that at the top of the panel, looking through the skylight? Page 4 – Panel 6: No man escapes the Manhunters! Page 4 – Panel 5: I’m not sure why Tom “remembers why his friends used to call him ‘Pieface’” as, according to Wikipedia, it’s a derogatory term indicating someone of low intelligence. Page 4 – Panel 6: The Grandmaster reveals that some people, unknown as yet, need to die – these are The Chosen whom we’ll meet in the next issue. In the meantime, he wants his sleeper agents to focus on destroying the heroes they know. Get used to reading “No man escapes the Manhunters!” – it gets said a lot in this series. Page 5 – Panel 1: The Hal that Tom thinks of is Hal Jordan, his old Green Lantern buddy. Page 5 – Panel 2: Unfortunately, he is discovered by some Manhunters. Page 5 – Panel 6: Is it me, or is PLOW the weirdest sound effect for a punch ever? Page 6 – Panels 1 and 2: Despite his valiant attempt, Tom gets a sound kicking from the Manhunters. Page 6 – Panel 3: If the caption of “The pie in the face…” is Englehart’s call back to Page 4 – Panel 5, then I’m either missing something or it just doesn’t work. Page 6 – Panel 5: A random cameo of the Flash fighting Gregor Gregorovich of the Russian team, Blue Trinity. Page 7 – Panel 1: This is the Green Lantern Citadel where, at this point in time, the remains of the Earth-bound Green Lantern Corps are based. 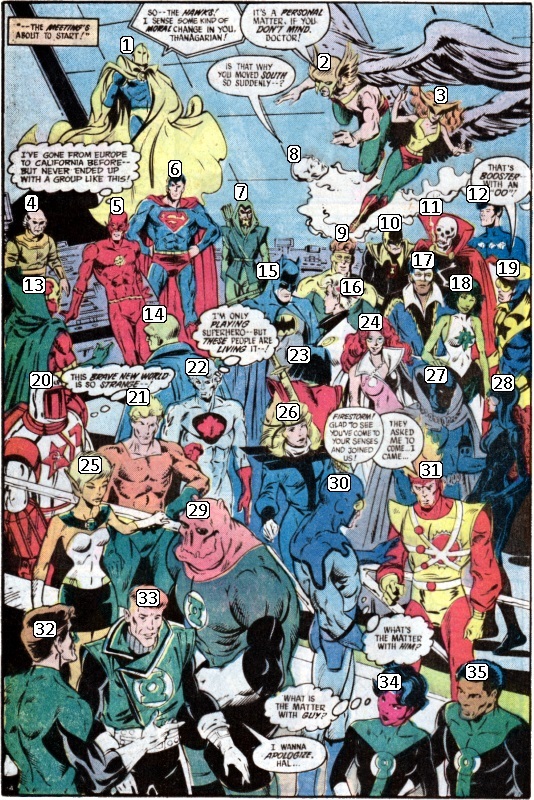 Page 7 – Panel 2: Beside and in the pool are the Green Lanterns; sitting at the edge are Arisia and Hal Jordan; in the pool are Kilowog, Katma Tui and John Stewart. Arisia’s comment about Kilowog losing his people refers to the destruction of his home planet Bolovax Vik during CRISIS ON INFINITE EARTHS. Page 7 – Panel 3: Arisia mentions fellow Lanterns Salakk and Ch’p. Page 7 – Panel 5: A Zamaron and Guardian arrive at the Citadel. They’ll introduce themselves in a moment, but the Zamaron is Nadia Safir and the Guardian is Herupa Hando Hu. Page 8 – Panel 1: As GL Hal Jordan clothes himself and his fellow Lanterns in their uniforms, Arisia mentions that both the Guardians and the Zamarons “were gone, out of the universe – to create a new race of immortals.” This happened in GREEN LANTERN #200 from 1986. Page 8 – Panel 2: A Guardian getting a hug from a Lantern – that sure wouldn’t happen these days! Page 8 – Panel 3: Nadia and Herupa introduce themselves. Herupa speaks of the same group of people facing danger that the Grandmaster mentioned on Page 4. Page 8 – Panel 4: John referring to Herupa as “Old Timer” is either a nod to the Guardian who accompanied Hal Jordan and Green Arrow on their tour around America in the early 1970s, or it’s a mistake on Englehart’s part, confusing Herupa with the Old Timer who was actually the Guardian called Appa Ali Apsa. Either way, Herupa says that there will be a need for more than just the five Green Lanterns. Page 8 – Panel 5: Herupa refers to The Chosen by that title for the first time. Page 8 – Panel 6: The Manhunters who attacked Tom Kalmaku have carried his body three miles to the Los Angeles Airport. Page 9 – Panels 1 and 2: In order to protect the secrecy of the Manhunters, Tom will be crushed by a 747, thus killing him and disguising the injuries he’s suffered at their hands. I can’t help thinking a staged car crash or explosion would have done the same thing as effectively. Page 9 – Panel 3: Tom thinks that both his legs are broken. Page 9 – Panel 5: And yet here he is, kneeling up. Page 10: Tom manages to crawl off the runway, though he appears to be rendered unconscious by the backwash of the landing plane. Given that the plane’s wheels are small in comparison to the width of the runway, the chances of him being crushed by the plane must be quite small. I’m surprised the Manhunters didn’t wait around to make sure he was dead. Page 11 – Panel 1: This is Harbinger, the one time partner/assistant of The Monitor during the CRISIS ON INFINITE EARTHS. Page 11 – Panel 2: That’s a brief cameo of The Monitor. Page 11 – Panels 4 and 5: Harbinger was the narrator of THE HISTORY OF THE DCU, a two-issue special that followed CRISIS. Page 12 – Panel 1: The Justice League International heading to the Green Lantern Citadel. Left to right are Oberon; Mr Miracle; Booster Gold; Black Canary; Captain Atom; and Martian Manhunter. The shuttle is presumably being piloted by Blue Beetle with Rocket Red #7 and Green Lantern Guy Gardner aboard. Why they didn’t all travel in that – particularly given the uncomfortable way Booster’s holding Canary – I don’t know. Page 12 – Panel 2: Dr Fate flying in at the top; Rocket Red #7 on the left facing off against Kilowog; and Batman on the right. Kilowog’s not happy with Rocket Red following the events of GREEN LANTERN #208 – #210 which resulted in the death of one of Kilowog’s friends, caused by the Rocket Red Brigade. Page 12 – Panel 3: Blue Beetle makes an appearance at the top of the panel (or at least his legs do) and Guy Gardner leans against the wall. Hal Jordan stands with his arm around Arisia at the front of the panel. 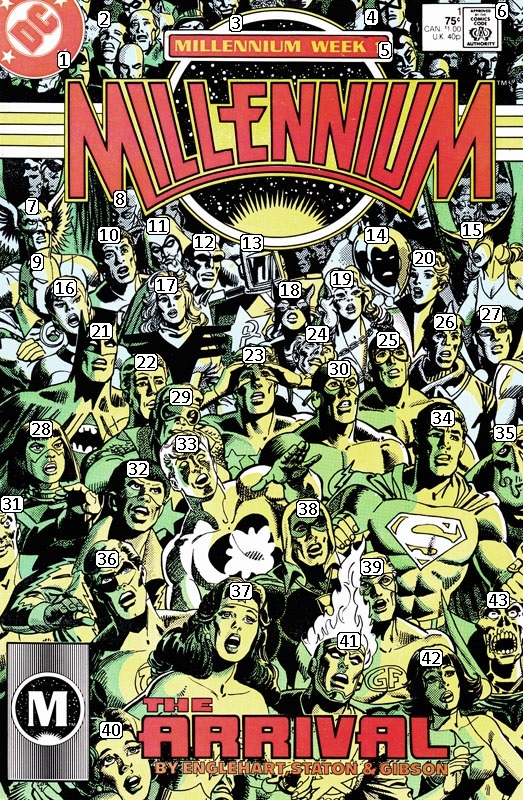 Page 12 – Panel 4: Guy’s optimism and sunny disposition confuses Hal; in the pages of JUSTICE LEAGUE INTERNATIONAL, Guy had been punched by Batman before knocking his head, causing a personality shift that saw him change from the usual boorish Guy to the cheerful and happy version that appears in MILLENNIUM. Page 12 – Panel 5: Batman says they’ve just returned from Germany – that was where they were on Page 1 – Panel 2 of this issue. His “other team” is The Outsiders . . . Page 12 – Panel 6: . . . who arrive on cue. Or at least Halo carrying Katana do. Dr Fate mentions “the Aurakle force” in reference to Halo who, it had been revealed, was an alien life form inhabiting a human body and which chose to remain on Earth. Page 13 – Panel 1: The rest of The Outsiders arrive. Left to right are Looker; Metamorpho (as a hang-glider); Black Lightning; and Geo-Force. Page 13 – Panel 2: And they all helpfully introduce themselves. Everyone in this panel has been named in this scene so I won’t go through them again here. Page 13 – Panel 3: Infinity Inc arrive. At the top is Skyman; below him is Jade. Left to right in the green bubble are Obsidian; Hourman; Mr Bones; and Wildcat. Page 13 – Panel 5: Jade mentions Alan Scott who, at this time, has vanished following CRISIS ON INFINITE EARTHS and the LAST DAYS OF THE JUSTICE SOCIETY. Scott was the original Green Lantern in the Golden Age and Jade’s father. 1st row: 1) Dr Fate 2) Hawkman 3) Hawkwoman. Page 15 – Panel 3: Guy Gardner mentions the Crisis and the Green Lantern Corps saving the Anti-Matter Universe. That’s what happened in the pages of GREEN LANTERN, but by this point we’re two years on from those events and, as per my notes on The Crisis Post-Crisis, the revised version of events was a war between the positive and negative matter universes so Guy’s comment doesn’t actually make sense. Page 15 – Panel 4: Herupa and Nadia give a condensed version of the origin of the Guardians and Zamarons. “Since the race no longer needed generational renewal, however, the sexes no longer had need of each other!” say Herupa, revealing a ridiculously narrow-minded view. Page 16 – Panel 1: A flashback to GREEN LANTERN #200 when the Guardians and Zamarons left this universe . . . Page 16 – Panel 3: Herupa revealed to the Green Lantern Corps in GREEN LANTERN #200 that there would be a new race of immortals. Page 16 – Panel 4: And so Herupa calls this whole thing, “the Millennium” but all that means is “one thousand years” . . . which is just a bit random. Page 17 – Panel 1: Manhunters and Hallas and Green Lanterns! Oh my! Page 16 – Panel 5: Superman subtly asking the Guardian to get to the point. Page 16 – Panel 6: And there it is – Herupa and Nadia will choose ten people to be The Chosen ones. 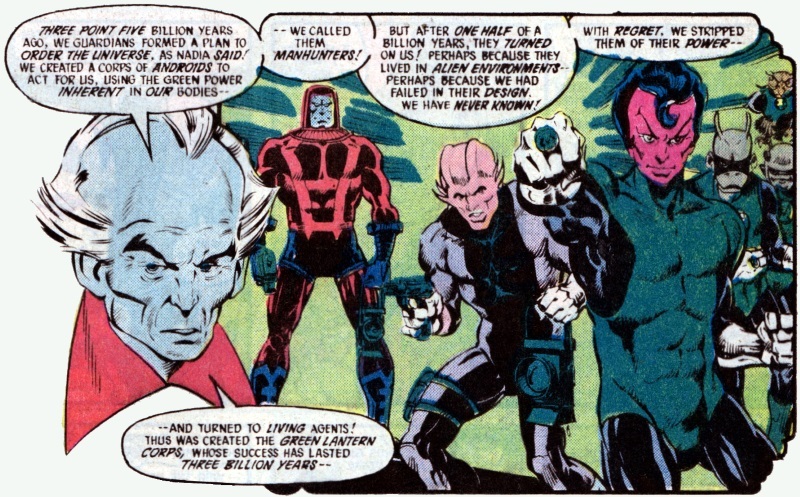 Page 17 – Panel 1: Herupa explains how the Guardians created the Manhunters and then, after the Manhunters betrayed them, the Guardians created the Green Lantern Corps. 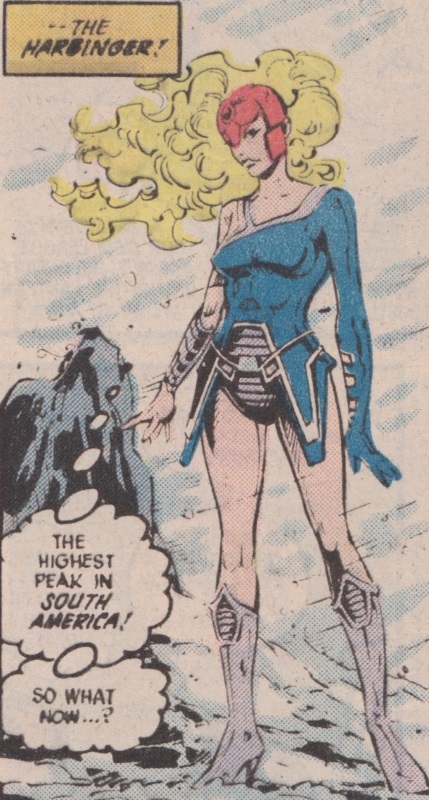 This panel is on the left here – despite them appearing in the panel, Herupa makes no mention of the Hallas, represented by the figure between the Manhunter and Rori Dag, the first Green Lantern. The Hallas were an interim attempt at a space police force and appeared only once or twice before being largely forgotten, including, it appears, by the Guardians themselves. Page 17 – Panel 2: Black Canary mentions a run in the Justice League had with the Manhunters; this would be in JUSTICE LEAGUE OF AMERICA #140 – #141 from 1977. Page 17 – Panel 3: Nadia both condescends to Canary and simultaneously denigrates her own people, claiming the Manhunters using power and shadow is taking after her and the Zamarons. 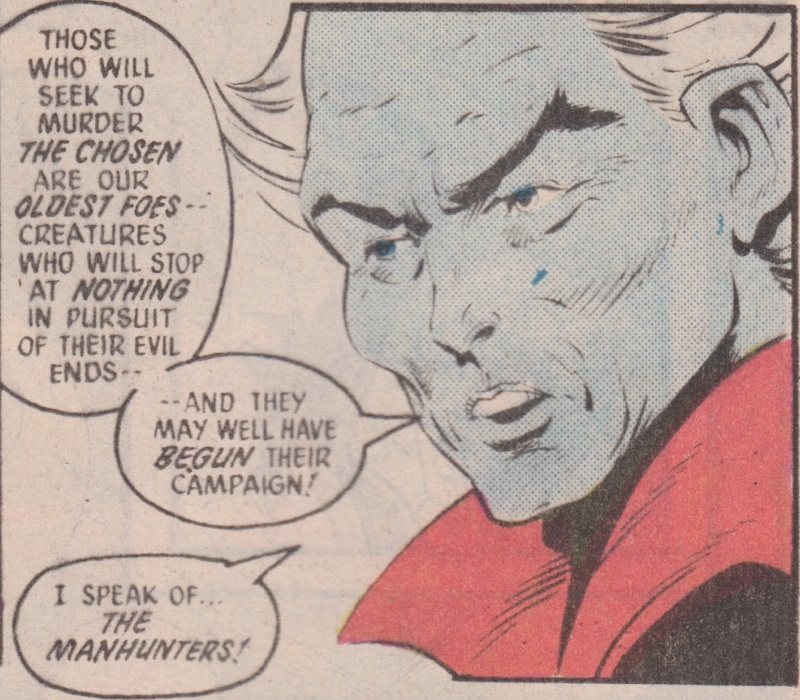 She also mentions the human followers the Manhunters have on Earth. 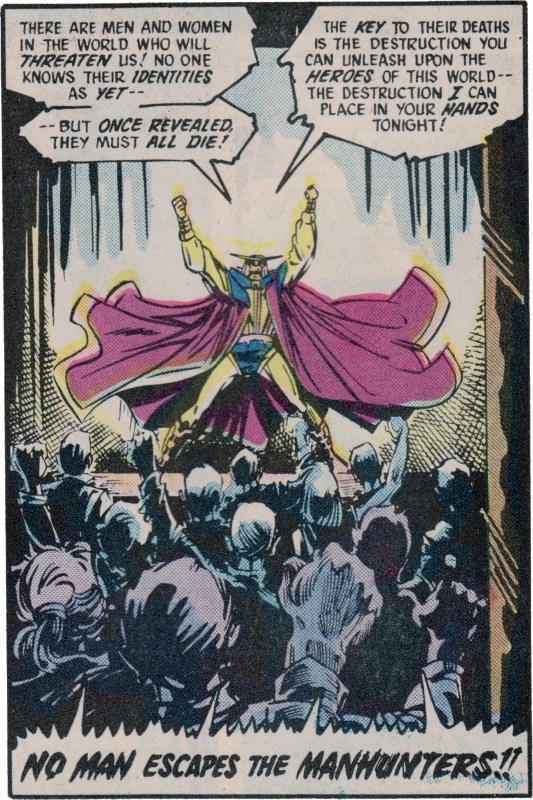 Page 18 – Panel 1: Is Hawkwoman’s comment aimed at Herupa? Is she accusing him and Nadia of “manipulating lesser beings“? Page 18 – Panel 3: Mr Miracle wonders why his home planet, New Genesis, is not being used as the cradle for this next evolutionary step. Page 18 – Panel 6: At this time, Mr Bones spoke in rhyme; this doggerel adds nothing to this scene. Page 18 – Panel 7: The Flash asks about his old team mates, the Teen Titans. Page 18 – Panels 8 and 9: Herupa and Nadia learn that Terra, one of their prospective Chosen, is dead. Page 19 – Panel 2: With that news, Herupa and Nadia decide to rethink their strategy and the audience is over. Page 20 – Panels 1 to 4: Superman rallies the heroes with some inspirational words and they agree to help when they can, as well as combat the threat of the Manhunter androids. Page 21 – Panel 2: Rocket Red #7 has something to say. Page 21 – Panel 4: As does Bernard Ferguson, chief of police in Pittsburgh. Page 21 – Panel 6: As does Dr Helga Jace. Page 21 – Panel 8: As does Rudy West. Page 21 – Panel 9: The first appearance of Wonder Woman in this story. Page 21 – Panel 10: And Pan, too, has something to say. Page 22: Each of the five characters reveals themselves as Manhunters to their colleagues. Page 22 – Panel 5: And there’s a call back to the opening line – nothing’s going to be ordinary any longer!